The Bell Beaker phenomenon is defined by groups that show a common know-how in technology, especially regarding pottery, copper metallurgy (Amzallag 2009), and flint. No single unified network of know-how transmission can be reconstructed, only local or regional networks (Linden 2015). Despite this, a supra-local homogeneity can be observed in the whole of Europe from ca. 2500 BC “in similar funerary rituals, in the way of interacting with territory, in the way of representing iconography and decorating pottery, and in the way of representing social differences” (Martínez and Salanova 2015). The Bell Beaker phenomenon made thus the previous regional networks of western Europe uniform with identical social codes. With the advent of radiocarbon dating, the compilation of Bell Beaker pottery dates (Müller and VanVilligen 2001) showed that the most likely origin of the pottery style was Iberia, pointing to high quality, tall beakers of the so-called maritime style. Only later were these dates and the Bell Beaker migrations integrated together in a common paradigm, when it was noted that the expansion of beakers with lower profiles and a more complex decoration, from East Group beakers, were replaced in the Danube area by plain jars, cups and plates. These vessels then dominated in the later developments of the culture (Harrison and Heyd 2007). The migration of mobile Yamna migrants into the plains of the lower Danube and the central Carpathian basin is noted in small and large groups in the Balkans, establishing pastoral societies as forerunners of Heyd’s “Yamna package”, with domesticated horses, ox-drawn wagons, and herds of cattle and sheep, and noticed as far as southern and central Germany. The so-called “proto-Bell Beaker package” is composed of essential early elements—such as the Maritime Beaker, copper knives and awls, advanced archery skills and reliance on the bow and arrow, and decorated textiles, perhaps also V perforated buttons—but lacks boars’ tusk bow-shaped pendants, stone wrist-guards, and the type of tanged dagger that become identified with the Classical Bell Beaker package later. This proto-Beaker package arises at the same time ca. 2900–2800 BC in the Tagus river estuary with a high concentration of monotonously decorated early Bell Beakers, associated with a new culture of large fortified settlements, megalithic tombs and collective burials. The proto-package is found for example in the Maritime Beaker, and it expanded ca. 2700–2500 BC, getting enriched through some areas in western Europe (e.g. in the corded Beaker type), but clear internal social boundaries existed in this period. This fashionable Bell Beaker idea turned into the classical “Bell Beaker Package” during its expansion to the east, reaching the Rhône and Britany in the 26th century BC, then arriving in central Europe (Suppl. Fig. 10.B), and the Csepel group of the Carpathian basin, around 2500 BC (Harrison and Heyd 2007). 1. The Beaker networks on an international scale, a system of power based on knowledge from distant parts (for the relevance of craftsmen in these networks, see below). This is related to the introduction of standardised and rich coloured textiles (dyes and morands), and refined drinking vessels (the bell beaker) used to share alcoholic drinks. 2. The creation of a socially inclusive system of belief, where additional identities (or social positions) are developed for people to acquire, which allows more people to participate (with defined roles) in the ceremonies of social promotion attached to the Beaker package, and thus welcoming more people to an enhanced status, with its new privileges. 3. The warrior self-consciousness, selecting the bow and arrow as status object for men. In its origin, macro-villages were designed for defence by many archers. The choice of archery with the expansion of the package creates a deliberate contrast to earlier styles of combat, which used hafted axes and daggers for close hand–to–hand fighting. Archery allows the warrior to fight at a distance, even from horseback, and can be concealed, which seems antithetical to a code of honour based on individual combat, where rivals face each other within hand’s reach. 4. The specific female counterpart to the male warrior, apparent in life on stelae (before the expansion of East Bell Beakers) and in death in the female Beaker graves. This was added probably late due to the Yamna package in western Europe, because it is absent in Iberia but present in Central Europe before its adoption by East Bell Beakers. 5. A specific religious expression linked to sun worship, generalised throughout Europe in the 4th millennium BC. A stela from Sion depicts the rising sun, and East Bell Beaker groups place the dead so that men and women face eastwards towards the sunrise (see below), which continues the western European solar cult. All these were part of the “Transformation of Europe” ca. 2900–2700, but the Bell Beaker package combined them into a single visual message of power, knowledge, heraldic objects and status, reinforced by a religious element. Local conflict in Sion shows that even Central European Bell Beakers (with an almost full-fledged package) did not show unity, until the expansion of the East Bell Beaker group. For example, the composite (half-reflexed) bow, which required specialised craftsmanship, expanded to all of Europe with the spread of East Bell Beakers after 2500 BC, but its development (from the original Iberian model) must have happened during the transition of Yamna to Bell Beaker, judging by its depiction in an anthropomorphic stela from a Yamna kurgan in Natalivka ca. 2700–2500 BC (see Figure 41), and its later spread throughout the Eurasian steppe (Klochko and Kośko 1987). The typical proto-Beaker bow, as represented in stelae and bow-shaped pendants, were simple longbows. Double-curved composite bows of small size were more practical and maneuverable, ideal for use from horseback, a warfare technique probably present in eastern Europe at this time (Corboud 2009; Ryan, Desideri, and Besse 2018). Figure 41. Left: Anthropomorphic stela above a kurgan grave of the Yamna culture (in a territory of previous Lower Mikhailovka culture), ca. 2700–2500 BC, depicting a man fitted out with the attributes of power (battle axe, staff of office, and composite bow), after V.N. Danilenko. 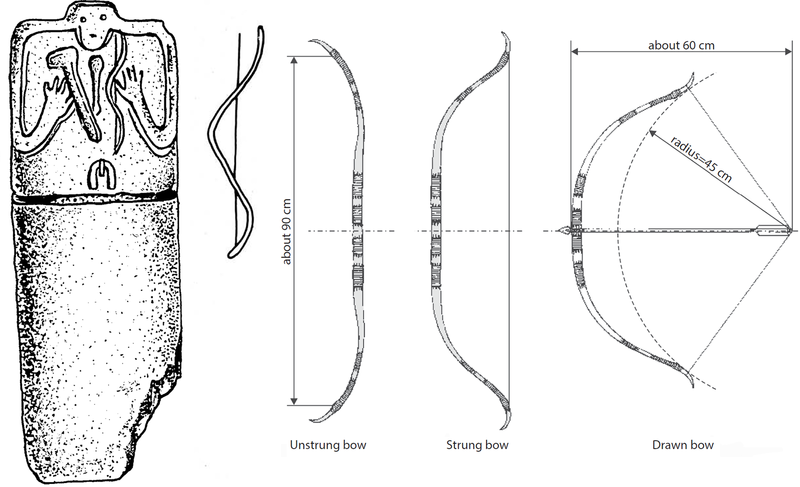 Right: Reconstruction of a bow from the Bell Beaker culture based on depictions in stelae by Corboud (2009), modified from Ryan, Desideri, and Besse (2018): Composite bows have a wider middle and a curve at both ends, which compresses the bow allowing for it to be shorter, yet with a more efficient transfer of energy to the arrow, maintaining the power seen in longbows. They were more complicated to make and required a higher degree of know-how than the simpler, single-piece wooden yew bows previously prevalent in Europe. The phenomenon accelerated dramatically when more people being involved seized the opportunity to promote themselves, by adopting the now well-defined package of novelties, so around 2500 BC Bell Beakers expanded explosively (Suppl. Fig. 11). It became thus a pan-European phenomenon, incorporating distant regions following the Atlantic and Mediterranean coasts and the main river systems, such as the Danube, Rhine and Rhône, and their tributaries. Distinct regional traditions were incorporated to different expanding currents, and eventually four large geographical entities could be discerned: the Central European domain or East Group, an Atlantic domain, a Mediterranean domain, and a north-west European domain including the Northern European Lowlands and Scandinavia. Within these large entities, different groups could be distinguished, such as the Rhenish/Dutch Beaker or the Northern Italian Beaker groups (Heyd 2013). With the emblematically decorated Bell Beaker, also shared previously to some extent in the Corded Ware beaker and in western Proto-Beakers, the ideal communal drinking vessel had on average enough content so that several persons could consume a special drink out of it, and its form forced one to use both hands for drinking, and then to hand it over again with both hands, in an almost ritual manner, to the neighbour. 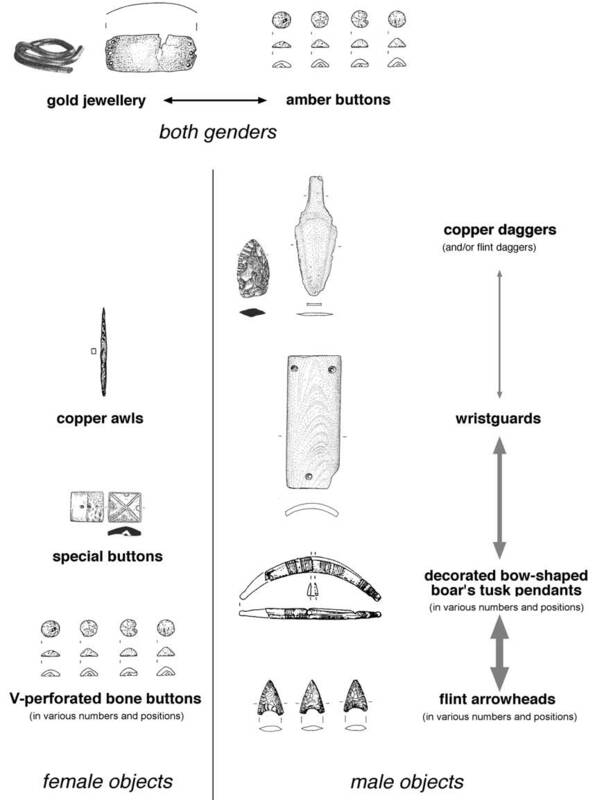 However, two elements seem to have been more interesting innovations for newcomers of any cultural background: the dagger idea—no matter if from metal or flint—and the archery idea, materialised in the arrowheads and wristguards (Heyd 2013). The Bell Beaker migrations over all Europe have long been associated with the expansion over central and western Europe of Yamna migrants through the Carpathian basin (Gimbutas 1993). Specific correspondences were found in burial rites, armament, costume, ornaments, technology in general, and also in ranked society, funerary rites, belief in life after death, and in general symbolism. · and no defensive position, hill forts, or fortifications, unlike later chiefdoms of the Bronze Age, where families and single persons gain power. This structure allowed for individual and social mobility, increased communication and internal exchange of information, goods, genes, and social values (Heyd 2007). · Specific finds such as the stocky and intricately decorated East Group Beaker, often with metope decoration; the many jars, simple cups, and plates appearing as Begleitkeramik (accompanying pottery); and smaller findings like broad 4-hole wristguards, decorated boar tusk bow-shaped pendants, and V-shaped perforated bone buttons. · Specific spectrum of settlement pottery, more varied than funerary ones, clearly distinguishable from western Bell Beaker groups and Balkan EBA cultures. o Gender-specific ritual, with men buried on the left side, females on their right side, both sexes in a foetal position. o Main orientation of the grave pit and corpse is north–south. o The dead face to the east. · Settlement type through non-intrusive frame-like, boat-shaped long houses featuring the use of light (which makes them difficult to find). Figure 42. Top: Osterhofen-Altenmark, grave 4: South German sample burial of the East Bell Beaker group, modified from Heyd (2004). Bottom: Reconstruction of a Bell Beaker burial (National Archeological Museum of Spain). The Classical Bell Beaker culture associated with this East Group is divided into phases from its initial stage ca. 2500 to the Early Bronze Age innovation waves ca. 2200 BC, which account for some 12-13 generations, assuming that each generation lasted 20–25 years. While eastern groups seem to go steadily through all phases, western ones in southern Germany have shorter initial and later phases, which point to an east–west drift of innovations during this period (Heyd 2007). Socially, East Bell Beaker graves do not show superior status at regional or supra-regional level. Because the burial goods reflected their use in real life, it is conceivable that views of the afterlife were aligned with the world of real objects and accompanying social categories. Cemeteries show relatively strong kinship ties, signalled by the ‘founder’ graves. which point to these groups as family units in a wide sense (Heyd 2007). Evidence points to an organisation into isolated communities living in fertile areas in a closely packed farmstead as the smallest unit, consisting of a single dwelling house inhabited by one family unit (with a small number of inhabitants), perhaps with additional farm buildings. These self-sufficient social units were economically specialised to a certain extent. Farmsteads located close to each other, sometimes connected through favourable landscapes, formed real settlements. However, where landscapes were not favourable, no central place is found (which is incompatible with the settlement model of egalitarian farmsteads), and neither are hill forts or fortifications of any kind, proper of later, Bronze Age groups (Heyd 2007). · Economic units are independent and make opportunistic alliances, reacting flexibly to emergencies and dangers from the outside. · They are more mobile, probably reflecting cattle-breeding and transhumance as the dominant herding strategy, individually and collectively, with less permanent settlements (Figure 43). · The command of an increased communication system, with internal exchange of information, goods, genes, and social values. They seem to have invested more in mobile possessions, such as copper and cattle, than in settlements. Figure 43. Top image: Map with evidence of animal traction before ca. 2000 BC. 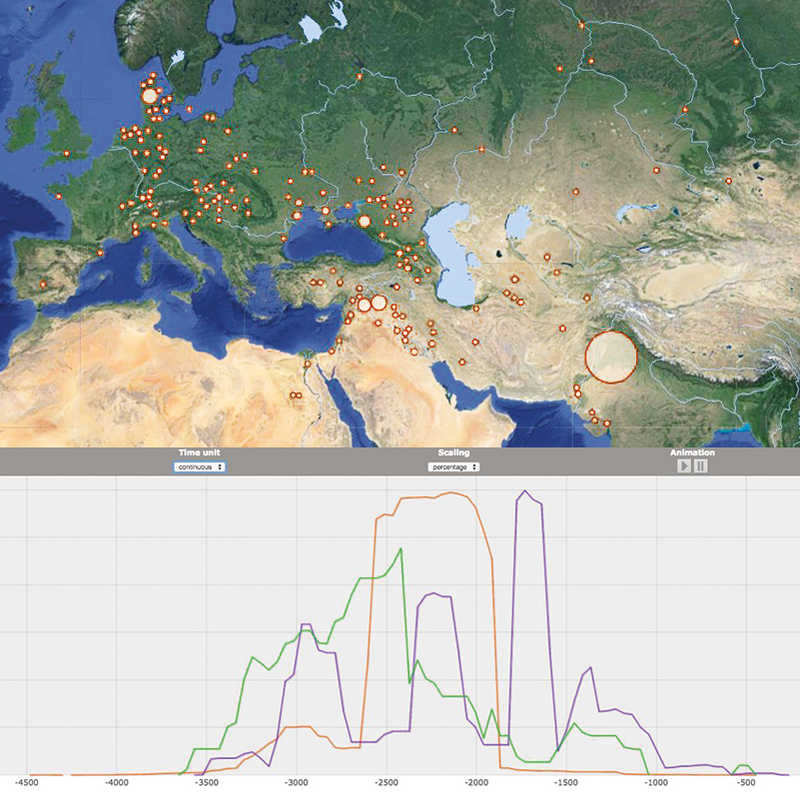 Bottom image: frequency of finds of evidence for animal traction (orange), cylinder seals (purple) and potter’s wheels (green) in the 4th and 3rd millennium BC (query from the Digital Atlas of Innovations). The data points to an early peak in the expansion of this innovation at the turn of the 4th–3rd millennium BC, while direct evidence supports a radical increase from around the mid–3th millennium BC until the early 2nd millennium, coinciding with the expansion of East Bell Beakers and related European Early Bronze Age cultures. Data and image modified from Klimscha (2017). · In comparison with Corded Ware graves, gold objects seem to increase in abundance dramatically, although they represent small quantities even in well-equipped graves, which suggests its origin as rare imported objects. Its presence continues into subsequent Early Bronze Age cultures. · For the first time, amber goods—until this moment constrained to cultures in contact with the Baltic, like TRB, GAC, and CWC—reach western Europe, and this connection forms the basis for the later ‘amber route’ of the fully developed Bronze Age. Shells in female burials, associated with neck ornaments made of V-perforated bone buttons, link Bell Beaker to the Mediterranean, probably travelling through the Alps. · Flint daggers, which spread with the Transformation of Europe, became prevalent in Europe after the expansion of Yamna, and with Bell Beaker they replaced the traditional stone battle axes, which had dominated burials in the region for a thousand years. Copper daggers, in many cases miniatures, are probably to be understood as symbolic artefacts, in a rank similar to the most precious objects, gold and amber artefacts. All these grave objects might have had special symbolic and magical values, connected with the social position of their owners, and demonstrating long-distance communication, an international system of values, and a supra-regional trade network. Apparently, the number of artefacts and their association (Figure 44) show a hierarchy of importance of these objects (Heyd 2007). Figure 44. Special grave goods in the Bell Beaker East Group. From top to bottom, rarer to more frequent objects, indicating its relative ranking. From Heyd (2007). Similar to the evolution of ‘holed’ axes of the LBK culture as battle axes in Central Europe (and their cultural successors in the Corded Ware culture), the explosive expansion of arrowheads in East Bell Beaker demonstrate its evolved function and ideology, in contrast to the frequent findings but in small numbers in LBK and in the Danube megalithic traditions. 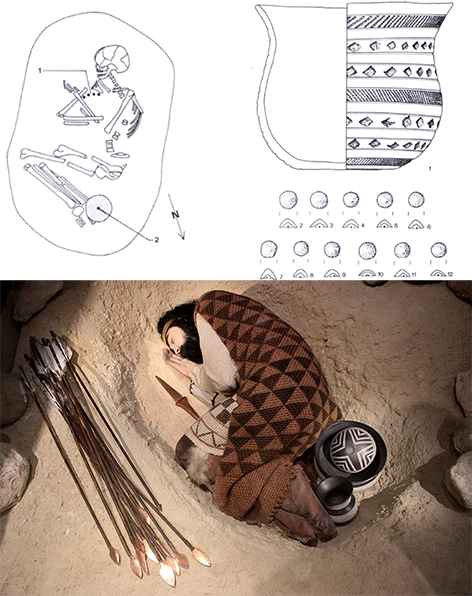 The archery image typical of the “archer’s package” and the complete set of archery equipment that appear in certain characteristic “archer burials” (where long wooden bows are supposed to have been interred too) point to a status object of the warrior (Heyd 2007). Specialised archery may be inferred from osteological remains (Ryan, Desideri, and Besse 2018). Horse riding-related osteological marks irrupt in central and western Europe with the expansion of Bell Beakers, as do horse bone remains, which support the suggested expansion of mounted archery. In a few cases, children were also interred with these prestige warrior goods, pointing to its supposed future role, possibly through his father’s line, suggesting thus rules of inheritance and dictated social status from birth. Such rich graves for infants existed also in CWC ca. 2700–2500 BC, although there was a clear differentiation according to the age of the deceased (the CWC ‘age classes’), which is not found in East Bell Beakers (Heyd 2007). Like dagger graves (a prestige good) or craftsmen’s graves, such warrior graves are rare, and some individuals are even physically larger, showing a better physical constitution. Nevertheless, these special graves occur within family cemeteries, but there are no gross inter-cemetery differences, which point to a loose regional connection between family units coexisting as equals. The internal hierarchy of family units—in the (at least funerary) egalitarian Bell Beaker society—points to an initial stage of stratification on its way to the fully stratified Bronze Age societies (Heyd 2007). Craftsmen’s graves (metalworkers, but also flintworkers) show their role in metal exploitation and prestige good production, especially graves of metalworkers (with copper daggers and wristguards, and special forms of grave construction), showing their particular economic and social importance in the Bell Beaker society. There is a clear direct evolution from the hundreds of craftsmen’s graves of the northern and north-western Pontic Yamna and Catacomb graves (ca. 2750–2250 BC), to the other, western European end in the Amesbury Archer in England (Heyd 2013). Settlement areas of both cultures, the Bell Beaker and the Corded Ware culture, especially in the common territories of central Europe, seemed to remain separated. Available data suggest rejection and aversion, but also some form of social discourse between the groups (Heyd 2007). Neighbouring groups of Bell Beaker, Globular Amphora and Corded Ware cultures of east-central Europe show certain similar artefacts, but made of different materials, and with different interpretations, which might signal imitation among culturally different groups. These cultural differences between Corded Ware and Bell Beaker cultures are maintained over vast distances, from east to west Europe (Czebreszuk and Szmyt 2008), potentially suggesting a strong ethnolinguistic difference (Figure 45). 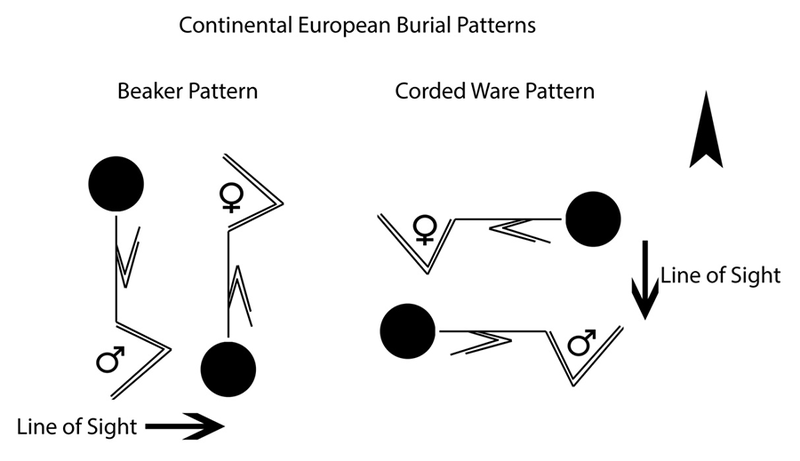 With the interaction of both groups, Corded Ware burials adapted to Bell Beaker customs, and a decline in Corded Ware remains is found in shared areas. Figure 45. Contrasting continental Bell Beaker and Corded Ware burial patterns. Image from Heise (2014). · and Bell Beakers from the Polish Plains, mixing with late Corded Ware groups in Eastern Europe to form Trzciniec. The regional substrate for many eastern and northern European Bell Beaker groups is in many cases formed by late Corded Ware culture groups, with some pottery types persisting in later times, and with individual burials being also used by later settlers. However, in western and southern Bell Beaker territory, previous regional substrates do not herald the Bell Beaker groups, with newer settlements using locations different to Late Neolithic sites, and collective graves being reused or substituted by individual graves (Besse 2014). In certain small, remote regions, possibly unaffected by the initial explosive expansions along rivers and coasts, Corded Ware groups dominate the records ca. 2500–2200 BC, such as in German Franconia and the Tauber River Valley. Gradually, though, these isolated units decrease in numbers and their ideology seems to have faded, no longer having a supra-regional grip, merging eventually within the succeeding Early Bronze Age cultures (Besse 2014). Tumulus building was identified by Gimbutas as one of the main cultural manifestations of the Kurgan culture (and “Kurgan people”) that spread Indo-European languages during the Neolithic. The practice of mound-building (and single graves) is nevertheless so widespread in time and space that it is hard to associate it with one particular ethnic group (Harding 2011). At the end of the Chalcolithic period, migration waves reached the Carpathian Basin: Yamna from the east, and Proto-Beakers from the north-west (Szécsényi-Nagy et al. 2018), probably following the Danube. Early individuals from the Yamna culture in Hungary show a fully homogeneous admixture with other Yamna groups, with one of four samples showing initial admixture with local EEF populations, hence the slightly elevated contribution (ca. 17%), statistically non-significant. A further contribution is seen in a later individual, with ca. 27% EEF ancestry, and a clear ‘central European’ shift in the PCA (Wang et al. 2018). Late Chalcolithic samples from Hungary showed mainly NWAN (ca. 86%) and WHG (ca. 14%) ancestry (Olalde, Brace, et al. 2018). This admixture of Yamna lineages with local populations represents thus the most likely starting point of emerging East Bell Beakers that expanded from the Middle Danube in all directions (Suppl. Graph. 9). These early stages of admixture are also consistent with the extreme genetic differentiation among early Bell Beaker samples from Hungary (Suppl. Graph. 10), e.g. in Szigetszentmiklós, in the Csepel island (ca. 2450–2150 BC): one of hg. R1b1a2a2-Z2103 shows 75% Steppe ancestry, and clusters closely with the Yamna Hungary EBA sample in the PCA; with him there are one individual of hg. R1b1a1b1a-L51 (ca. 47% Steppe ancestry), one of hg. I2a1a1a-L158 (ca. 59% Steppe ancestry), and another of hg. I2a1b1-M223 (ca. 47% Steppe ancestry), all four males with typical burial position and Bell Beaker assemblages (Olalde, Brace, et al. 2018). Slightly later samples from the same site, from the succeeding Proto-Nagyrév culture, show a higher variability of haplogroups in the area (see §viii.11. Thracians and Albanians), including the presence of a basal lineage R1b1a1b1a1a-L151* (formed ca. 2800 BC, TMRCA ca. 2800 BC), further supporting the nature of the Carpathian Basin and the area around the Tisza river as the sink of Yamna settlers. The source of expanding Bell Beakers, which show a clear Y-chromosome bottleneck of R1b1a1b1a1a-L151 subclades, was probably closer to the Middle Danube area, between the Devín Gate and the Danube Bend, around the Little Alföld. Previous to these Early Bronze Age samples from Hungary, where most paternal lineages descend from elite males of Yamna clans, the Carpathian Basin showed typical East European farmer ancestry and lineages, approximately half G2a2-L1259 and half I2-M438 subclades. Subclade I2a1a1a-L158 is found in two samples from Balatonlelle (one ca. 3600–3000 BC, another ca. 3330–2930 BC), with the same haplogroup also reported in later East Bell Beakers from the area (Lipson et al. 2017). Steppe ancestry has been found thus spreading with expanding East Bell Beakers to the west, whereas no substantial contribution is found from Iberian Beaker Complex-associated individuals to central Europe (Olalde, Brace, et al. 2018). The expansion of Yamna settlers with a main bottleneck under haplogroup R1b1a1b1a-L51 from western Yamna settlers—evidenced by the expansion of its subclade R1b1a1b1a1a-L151 with Bell Beakers—is also supported by the finding of subclade R1b1a1b1a1-L52* in south-eastern France, and by the distribution of its other subclade R1b1a1b1a2-Z2118 (formed ca. 3700 BC, TMRCA ca. 3100 BC) in south-eastern Europe, hence likely associated with early west Yamna settlers, and the further expansion under SNP Z2116 (formed ca. 3100 BC, TMRCA ca. 2700 BC) into R1b1a1b1a2a-S1161 (TMRA ca. 2700 BC) throughout central and western Europe. Speakers of the North-West Indo-European language have been recently associated with expanding East Bell Beakers (Mallory 2013), as an offshoot of Yamna, due to the fitting guesstimates for this reconstructed stage. The expansion of the Proto-Beaker archaeological package along the Upper Danube probably allowed for its cultural diffusion through the river basin among the thousands of Yamna settlers related to the Pannonian Steppe—distributed from the Tisza River and its tributaries and the Middle Danube up to the Austrian Burgenland—just before the renewed impulse of expansion of the classical Bell Beaker folk. Agricultural substrate loanwords in common to Palaeo-Balkan languages, some of them with potential traits of Afroasiatic nature, are probably due to contacts of expanding Yamna settlers with farming communities of the north Pontic and the Lower Danube regions, which had strong links with hunter-gatherers of haplogroup R1b1b-V88 (Kroonen 2012). The few loanwords of a supposed Vasconic-like origin, apparently concentrated in a later stage, are probably due to contacts with communities derived directly from the early waves of NWAN-related European farmers, probably from the Pannonian Basin, where most non-Indo-European substrate words in North-West Indo-European were likely borrowed. It is therefore likely that the evolution from a Pre-North-West Indo-European stage to a fully-fledged North-West Indo-European language spanned the west Yamna (ca. 3300/3100 BC) to the expanding East Bell Beaker community (ca. 2500-2300 BC). Book One: A Song of Sheep and Horses: eurafrasia nostratica, eurasia indouralica. Book Two: A Game of Clans: collectores venatoresque, agricolae pastoresque. Book Three: A Clash of Chiefs: rex militaris, rex sacrorum. Book Four: A Storm of Hordes: hic sunt leones, hic sunt dracones. Avda. Sta. María de la Cabeza, 3, E-LL, Badajoz 06001, Spain. Cover image Bronzegießerei by Gerhard Beuthner, appeared in Erdal-Bilderreihe Nr. 115 Bild 1 (1930). This work is licensed under the Creative Commons Attribution 3.0 Unported License. To view a copy of this license, visit <http://creativecommons.org/licenses/by/3.0/> or send a letter to Creative Commons, PO Box 1866, Mountain View, CA 94042, USA.